There is a haunting stillness to ''Soon the Storm'' by Michael Kidd. He has captured the calm before the storm. 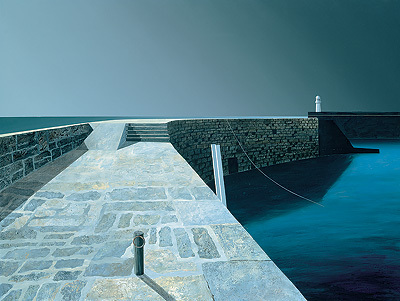 Michael Kidd has a distinctive painting style. He produces contemporary paintings with clean, clear lines and high definition. ''Soon the Storm'' shows a quay and lighthouse lit by moonlight and his use of light and shade creates drama in the limited edition print. All Michael Kidd signed limited edition prints from Red Rag Art Gallery have been reviewed by the artist. This guarantees that all art prints offered by Red Rag satisfy the high quality and fine art standards set by Michael Kidd for prints. Each limited edition print series from the Red Rag British Art Gallery is normally available for immediate delivery and can be shipped worldwide. Click here to view more contemporary limited edition prints by Michael Kidd.